Cheese as a product with dairy ingredients, is an alternative that can be used to meet the demand for animal protein. Almost all cheese sold in our country is a hard cheese, ie cheese that requires longer maturation stage so that the higher production costs. Cottage cheese with a method of setting short, is one alternative in a decrease in production costs. Currently the cost of cheese production is very high, because the enzyme rennet used in cheese-making process is very expensive and available in limited quantities (Sardinas, 1972; Sardjoko, 1991). Cheese industry can use other coagulant enzymes such as fisin of ficus sap, papain from papaya, and the enzyme bromelain from pineapple (Winarno, 1986). The enzyme papain as one of the rennet enzyme replacement has some advantages such as more easily accessible, available in large quantities, is more resistant to acidic and alkaline conditions, high temperatures and it's cheap (Sirait in Anonymous, 1991). Enzyme papain as a protease Sulfhydryl can be activated by the reducing substances and become inactive if there is an oxidizing substances. Burges and Shaw in Godfrey and Reichet (1986) states that the enzyme papain break the peptide bond at residue asparagine-glutamine, 13 glutamate-alanine, leucine, valine and penilalanin-tyrosine. This enzyme will work optimally depending on the concentration given. In the process of making cheese, temperature plays a role in determining the length of the process and influence the type of cheese that is formed thus including soft cheese or hard cheese (Radiati, 1990). Thus need to be reviewed about the use of papain enzyme and fermentation temperature in the manufacture of cottage cheese, with the aim to determine levels of the enzyme papain and proper fermentation temperature in the manufacture of cottage cheese. Of research is expected to provide basic information and considerations for the use of enzymes rennet to reduce production costs of cheese. Cottage cheese making is done by setting short method. 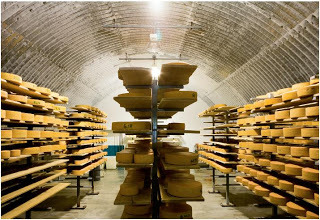 Skim which is the basic ingredient of cheese is pasteurized at temperatures 630C for 30 minutes, cooled to 400C as the incubation temperature, then added 4% (V / V) starter and is stored in an incubator with variations temperatures 350C, 450C and 550C. After growth reached pH 5.6, added enzyme papain with varying levels (320 ppm, 520 ppm and 720 ppm) for 5-6 hours. After the acidity reached approximately 0.52% (pH 4.6 to 4.7) is done cooking curd in water bath for 1 hour, after which the whey disposed. After the whey is disposed then is added water in amount equal with the curd, stirring gently for 10 minutes, then water is removed. After the disposal of salt water is added 4% NaCl (w / w) and formed cheese. 0 Response to "How to Make Cheese"